we're going to put in a written offer on that house tomorrow. there will be some qualifications, though. they have to fix the floor. 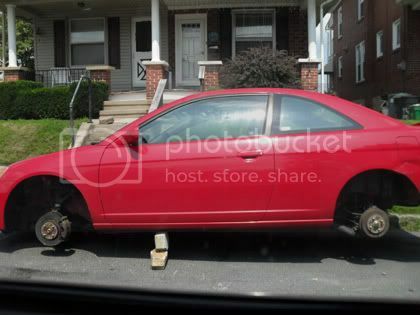 also, if there is a unreasonable amount of problems found during the inspection, I want to have the option to back out. we have to put down $1000 as some sort of good faith thing - I imagine I get this back if things do not work out. this is pretty scary - it's serious business now. Chris and I spent most of the afternoon at Home Depot getting decorating ideas. I know this is the opposite of not getting our hopes up, but I could not help it. it looks like a lot of things are not as expensive as I expected, which is nice. I think that the tax credit should go a good way towards getting rid of the uglies. assuming we get that house, of course. front doors, though, are a good deal more expensive than I expected. like, some of the doors we were looking at were the same price (or more) of some full sets of cabinets for a 10x10 kitchen. that doesn't make sense at all. we also went to IHOP, which was delicious. I had the same thing I always get - the stuffed french toast combo. such a bargain! I wish we could have off on Friday instead of Monday for Labor Day. Chris has to work Saturday, Sunday, and Monday, but he has off on Friday. that is so lame, there aren't even words for it. last night was a family picnic at my parents' house. it was a lot of fun, even though it did rain. the food was good, and I finally learned to play Hearts (which I have been playing on the computer for years but never truly understood). after that we went to SteveMikeBobby's house. we didn't really do much except watch Dirty Jobs and Flight of the Conchords, but it was a really great night. it felt like old times, with rousing conversation until 4:00 in the morning. this has been happening more frequently lately, which is good. if only we didn't all have to go to work all the time. we are looking at a new house that has our hopes up. there is a bit of a floor problem in one of the bedrooms, but our realtor says maybe they will fix it in order to sell to us. we shall see. I am through being optimistic. had a bit of a breakdown on Wednesday, I am so very sick of all this house disappointment. cried a bunch and went to bed before 10:00.
still haven't gotten my ADiML pictures up because I am very lazy. it's a serious problem. we went to Smokey Bones on Tuesday. the pretzel sticks are back! hurrah! also, they have a frequent diner club which I have (of course) joined. I get so many free coupons from so many restaurants - it really pays to join these things, really. I rarely pay full price for food. for the first time since april, it actually feels decent in this apartment. amazing! today was a pretty good day. had to wake chris up for work at 6:3o, but I got to go back to sleep after he was up and walking around. I went back to sleep until about 10:00. Chris came home eventually. 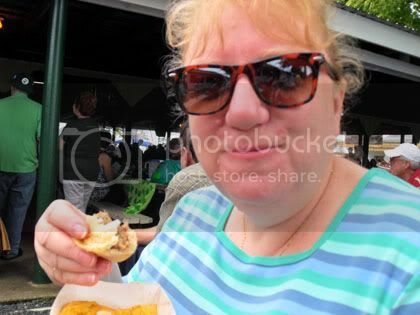 we watched Show and 16 and Pregnant (well, mostly I was watching that - he just happened to be in the room) until it was time for me to go to the Celtic Oyster Fest with my mum. survey with explict detail, making sure they knew exactly what needed to be changed. 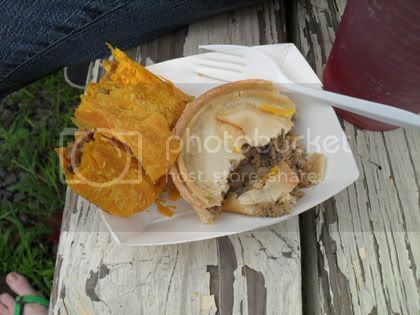 we had a pastie and a meat pie for lunch. the pastie was way too spicy for me, so I mostly ate the edges of that one. I gave the rest to Mum. after that, Chris and I went to his cousin's 16th birthday party. I had a good time, but it made me feel very old. she and all her friends were all actin' like crazy 16 year old kids while we old people watched and smiled and remembered. we were supposed to go let Chris' parents' dogs out after that, but they got home before we had a chance so we went to DQ instead. we came home and watched more anime, but ended up falling asleep on the sofa. we woke up at 9:30 because my phone was ringing. Bobby wanted to know if we were coming over. for once, I was the one who really felt like hanging out, but Chris was too tired (and with good reason), so we ended up staying home. Chris was asleep by 10:30 (this has to be a new low for us - asleep in bed by 10:30 on a Saturday night), but I am obviously still awake. I have been watching more 16 and Pregnant. it is mostly infuriating. people are very, very stupid. we went to visit Matt's grave today. it has been seven years. I didn't know him very well, I joined this wonderful group of guys too late. I do, however, know these guys very well. I can't express in words how touching and heartbreaking and beautiful it is to be a part of their mourning. The displays of camaraderie make me want to break down and cry. house I liked was a no-go. it had several problems: no heater, well & cesspool too close together, chimney pulling away from the house, etc. the search continues, I suppose. I am very sick of houses. I collected pictures of the beach from everyone, but I haven't gotten a chance to sort through them yet. maybe tonight? still haven't washed those dishes. the beach was a good time! sorry for the lack of tweets, my phone battery died promptly when we arrived at my aunt's house. why didn't I just charge it, you ask? your guess is as good as mine. but yeah, I had a lot of fun. I took a depressingly small amount of pictures, but my mum and sister made up for it - I will scavenge their pictures and make a big post about the trip sometime later this week. thursday, perhaps? in other news, I found the cord for my scanner when I was packing for the beach. aso now I can finally scan my drawings onto the computer. hooray! Chris is off playing M:tG with Steve somewhere in Lancaster. it is only fair, he accumulated a lot of awesome points this past weekend. plus, I am enjoying the time alone. I took a nap w/ Morgaine, scanned a drawing, ate some pizza, read some web comics, browsed facebook... it's been a productive night. I haven't, however, gone anywhere near the sink full of dirty dishes. going on vacation is a lot more stressful when the household stuff when you live on your own! Chris got up at 4:45 this morning in order to get done early so that we can leave as soon as possible. that is dedication. there aren't words for the ways he continually impresses me. I made him breakfast and tea while he got ready, but I went back to bed until 8:30. I figure at least one of us should be well-rested, otherwise we will get hopelessly lost. I think he said he would probably get done around 1:00, but knowing that place he works it will undoubtedly be later than that. he was supposed to have off today, we had planned to leave Thursday evening, but there was a scheduling problem and they made him work anyway. jerks. I am so excited and nervous. I have waited for this for seven years - I hope everything goes well and we have a really good time. I'll take lots of pictures, you can count on that. I doubt I will have access to the internets, but maybe I will text some Twitter updates or something. I should be packing for the beach, but instead I am looking at webcomics and old old old blog entries. we went to look at four more houses yesterday. I really liked one of them; we shall see. there are fireworks going off outside. at least, I hope they are fireworks. otherwise there is a serious problem. we really need to find a house... this picture was taken this morning on the street behind our apartment. they couldn't even be bothered to use cinder blocks, it would seem. they instead chose an assortment of bricks and rocks.